This exquisite one-bedroom is one of the most beautiful and special apartments in the picturesque 'Old Town / Stare Mesto' center of Prague. Completely renovated, our 95 sq-meter (1,022 sq-ft) apartment was rebuilt with exclusive designer elegance in mind, mixing high-end, modern amenities with classic features to create a bright, luxurious living space. Overlooking a tranquil cobblestone square in the Josevof quarter of Old Town, you will find yourself walking distance from all major historic and cultural attractions. Old Town Square and Prague's famous Astronomical Clock are only 3 blocks away. Walk through the winding streets of charming Old Town to reach the Charles Bridge, Wenceslas Square, Municipal House and the Power Gate, all within 10 minutes walk. Prague's historical Synagogues, and elegant Parizska shopping street, are within 5 minutes. Restaurants and cafes abound, as well as bakeries, specialty food stores, and large markets if you choose to cook at home. All the comforts of home, washer-dryer, dishwasher, fully appointed gourmet kitchen, big, beautiful bathroom, fast Wi-Fi... There is no 'short-term-stay' feeling to our place, (no Ikea furniture! ), and we are proud to share it with discerning guests - this is truly a magical apartment! State of the art kitchen is fully equipped for preparation of gourmet meals, featuring high-end european appliances - Siemens convection oven, cooktop, garbage disposal, dishwasher, and built-in stainless steel microwave oven. Caesarstone countertops highlight beautiful Italian cabinetry by Scavolini. Master bedroom overlooks a quiet courtyard and features a large open dressing area surrounded by built-in closets and drawers. Heavy curtains provide a dark bedroom for sleeping. Luxurious master bathroom has double sinks, large jacuzzi tub, separate glass-enclosed shower, heated granite floors and heated towel bars. All furniture was custom-built in Italy. New parquet floors. High ceilings, built-in and recessed lighting throughout on dimmers. Internal filtration system purifies and softens all water for drinking and bathing. Bosch washing machine and dryer in separate laundry room. Working elevator to apartment on fourth floor. The apartment is safe and quiet -- the church that faces the living room does not chime its bells. Softly and beautifully lit at night, this church gives our square a picturesque and peaceful ambiance. American-owned. Our guests can reach us by email or phone in Los Angeles, with questions about the property, neighborhood, or for insight or suggestions while planning your holiday. We email our guests a list of our personal favorite sights, walks and restaurants, both on the beaten path, and off. Our local property manager is a UK native who has lived in Prague for 20 years, and additionally offers dependable airport/ train station transfers, and is your personal connection in this magical city. In 2012, our building underwent a complete and meticulous historic renovation. The building itself is now as splendid as the interior of our apartment, freshly brought back to it's original colors and condition, with a beautifully restored foyer, new elevator and restored facade. We have had nothing but great experiences with our rentals since 2010, and look forward to even more thrilled responses from our guests! Maia lives in Los Angeles, where she is currently raising her young family. A Boston native, she has long loved Prague and welcomes guests to enjoy her home there. She is available to help with any questions guests may have about her apartment, the neighborhood, or Prague in general. She enjoys corresponding with guests about their upcoming trips, helping with tips and recommendations. When we saw this apartment, we fell in love! It is an exquisite gem, on what we think is the most tranquil and beautiful square in all of Prague. It is a dream destination, nestled in the heart of a charming, magical city whose historical architecture has remained intact. We never tire of wandering Prague's winding cobblestone streets, and exploring the countless museums, restaurants and cafes. Prague is a great city for music, both contemporary and classical. We walk to amazing concerts, stopping for ice cream, wine or cappucino on the way home. We are sure your stay will be as special and memorable as ours have always been. Luxurious master bathroom has double sinks, large jacuzzi tub, separate glass-enclosed shower, heated granite floors and heated towel bars. Hairdryer and flatiron. Parking in historic center is very costly. We can arrange for reasonable rate in a safe garage a few kms away, where our property manager parks. He can meet you and transport you to & from the apt. 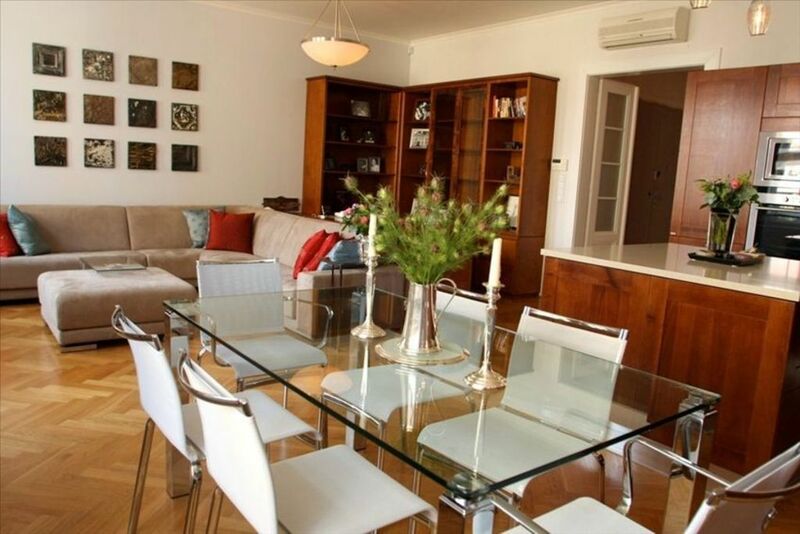 Truely the most beautifully and thoughtfully appointed, and perfectly located, apartment for your stay in Prague! Insulated french press-style coffee maker. Electric kettle. We maintain a full library of current tour guides and other books about the art, architecture and culture of Prague! Also maps and other necessities for enjoying the city to its fullest. Intercontinental Hotel health club nearby offers short-term memberships and pass packages, spacious fitness facility with pool and saunas. Small outdoor ice skating rink in walking distance in winter. State of the art kitchen is fully equipped for preparation of gourmet meals, featuring high-end european appliances - Siemens convection oven, cooktop, dishwasher, and built-in stainless steel microwave oven. Caesarstone countertops highlight beautiful Italian cabinetry. All furniture was custom-built in Italy. New parquet floors. High ceilings, built-in and recessed lighting throughout on dimmers. Internal filtration system purifies and softens all water for drinking and bathing. Bosch washing machine and dryer in separate laundry room. Modern elevator to apartment on fourth floor. The apartment is safe and quiet - the church that faces the living room does not chime its bells. Softly and beautifully lit at night, this church gives our square a picturesque and peaceful ambiance. To come home to at night. Would definitely stay here again if ever in Prague! We could not have found a better place to stay in Prague. Not only was it convenient to everything, but it is an extremely comfortable and fashionable accommodation with a very responsive host. It’s perfect! Hope to return some day.